Ok so today I picked up 6 zebra danios and 3 black diamond shrimp for my 40B. Upon checking out the not so LFS stated there were probably a few babies in the bag. Sure enough when I got home I counted about 3 baby BDS. Not really setup to raise the babies as my 10g with shrimp has a betta who A.) did not like the BDS and B.) would eat anything that small. So the NSLFS had the "special" shrimp in large jars with what looked like fluval plant stratum (or maybe sl aqua soil) and a few mosses. They all were apparently doing just fine like that. Anyhow right now they are in a 1qt mason jar with a mix of water from my tank and the LFS bag, a marimo ball, and some little leaf floating plant he threw in there. Long winded post but curious if I should just throw them in the 10G or keep them in the jar and hope for the best or do I really need to try and setup a little tank with stuff from my 10G? Well decided to setup the old half gallon betta tank. Its got kind of a low flow internal filer (like a hob but on the inside). Took a little substrate and water out of the 10g, swapped the foam pre filter from the 10 to the .5 tank (put an older on back in the 10), threw a couple of morino balls and some moss sprigs in along with the floating plants. Also took one layer of filter material out of the AC30 Ive got on the 10. Will see how they do, should have plenty of bacteria and what not. My oldest daughter (5yrs) will enjoy watching them grow if it happens. I would buy a cheap small air pump and stone and drop it in there to agitate the water a bit for oxygen for the bacteria to use... The should be fine. In fact I bet if you left it long enough you'd have a whole colony in there. As long as the water parameters are stable, within preferred range, and they aren't overfed (if tank has biofilm, they don't need to be fed!) then they'll probably do fine! However, smaller tank means an easier shift in parameters... so be careful. Well here is one of the three I picked up. Just moved her to the baby tank because pretty sure she is berried (along with one of the other ones). Its really hard to tell with them being almost all black. Constant fanning of the belly and looked like moving the eggs around but hard to tell. Here is a pic of one of the babies. Hard as heck with the cell phone. Its on BDBS (for size reference). Wish I had my 40D, old but takes good photos with the right lense. Well my half gal tank is exploding with activity. 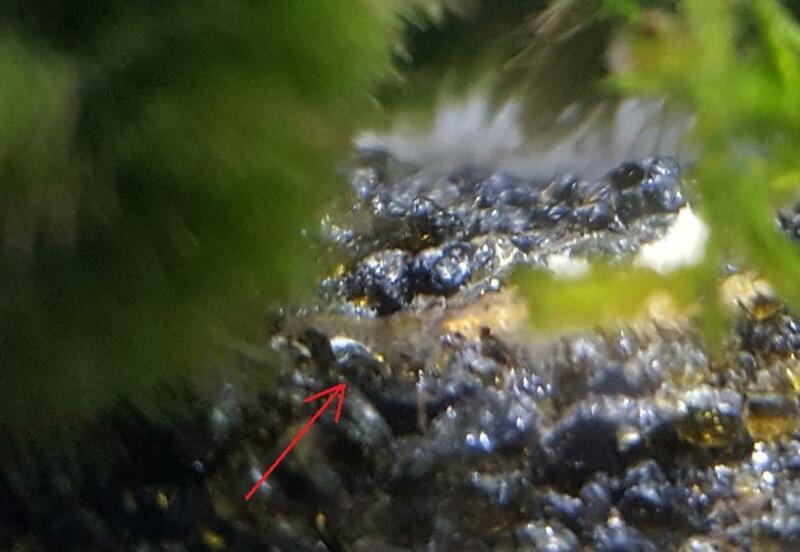 The 3 baby shrimp I see occasionally. Tonight I noticed I also have dalphnie and detrius worms, oh and 4 baby fish of some undisclosed breed. 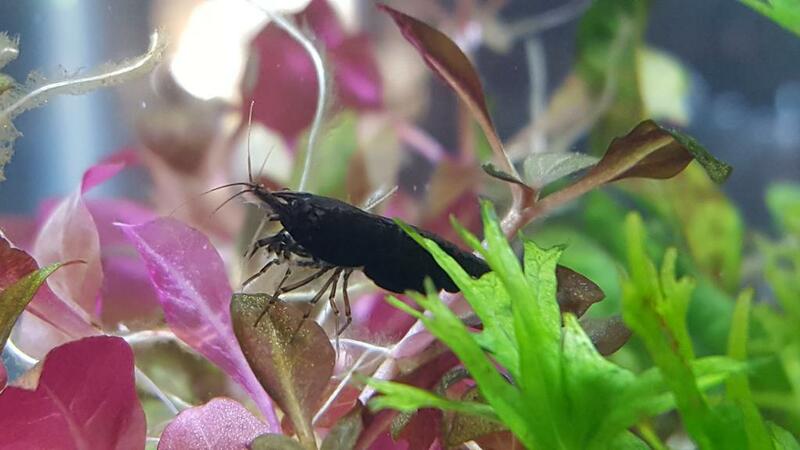 I was wondering why the shrimp were sticking to the glass then was like that doesnt look like a shrimp. The little fry are just a little smaller then the shrimp babies. Not usually a fan of mystery fish (Usually this ends with a empty tank and a few Jack dempseys fighting with each other) but will see what happens. The babies will swim around for a little bit then take up there position on the glass. Well the baby fish are schooling kind of. The shrimpers are harder to find now, they seem to be aware they are shrimp all of a sudden. The fish I can only assume are zebra danios (had them in my tank for about a week before they started harassing others and had to take em back), or neon tetras. The shrimp house was in my main tank before I put it in with the baby shrimp so it had the possibility to have eggs dropped on it. The other fish in the tank are False juliis but these fry dont look like cory fry. Sorry forgot to update. Ended up having to leave the tank for a while so had to take it down. Transfered everything to my 40B. The shrimp babies hid so not sure how they will do, pretty sure two of them were big enough to survive if they are even half way able to hide a bit. The baby fry did ok for a bit but the neons eventually decided to eat them. They ignored them for a good hour or two but then decided they were tasty I guess. Wasnt planning on raising any fish babies right now, so busy raising my own its hard to even maintain my two main tanks.